Callie grew up in Hout Bay and, after qualifying with a commerce degree at the University of Cape Town, she has worked as a Project and Financial Manager In Corporate for 20 years. She is now a passionate, dynamic member of the Books and Beyond project team and her skills are well-utilised in the management and coordination of all aspects of the project and various programmes. Her drive and determination to succeed are invaluable to the project. Callie has always wanted to try her hand at teaching, so being part of a project promoting education ticks a dream box. Callie is mom to a daughter and a teenage son. She runs, plays hockey, hikes, rides motorbikes and horses but her favorite is spending a day reading a good book! Tracy finished at the University of Cape Town with a teaching degree in English and Psychology. Involved in education, teaching, training and literacy throughout her career, and with work experience ranging from secondary school teaching, adult literacy training and human resources to editing and proofreading, Tracy brings all her skills and experience to bear on the Books and Beyond project and programmes. Her communication and organisational skills are a practical contribution to the project team. Tracy is mom to two boys, one a teenager and the other a bit younger, and enjoys hiking, being in nature and reading, and is a new convert to running as exercise. After 20 years in corporate life at Santam, Louise decided to leave the rat race and steer her energy towards a more rewarding goal. She found an opportunity to do this by joining the Books and Beyond project team and being part of change within a school. Her Diploma in Personnel Management and years of Human Resources experience are indispensable in her many contributions to the team. Louise is a team player and a self-starter, both strengths crucial to the success of the team and their objectives. With her calm demeanour, she is key to the relationship building so necessary between the project team and the school. Louise loves her current focus on leadership development and other training for the volunteers on the Year Beyond programme and on assisting with leadership development for the school’s management team. Her love of reading is given an outlet in her participation in the morning literacy programme. Louise is mom to two growing boys and also enjoys running, quad-biking, spending time with family and friends, hiking and body-boarding. Amy is passionate about helping to solve the education crisis in under-performing primary schools. Having qualified as a Foundation Phase, remedial and art teacher, she brings important specialised skills to the Books and Beyond team’s work and goals at Sophakama Primary School. The team is well-supported by her work experience teaching at Grade 2 level at Grove Primary School and running her own playgroup for 13 years, specialising in sensory integration disorders. Amy assists with the literacy project, aimed at Grade 2s and 3s and she manages the Year Beyond Programme, training young volunteers and managing them in their after-school literacy and numeracy teaching of Grade 1–4 learners. Her empathy and listening skills are valuable when dealing with learners and volunteers. Amy is mom to two teenage daughters and enjoys reading for pleasure and knowledge, yoga, beach walks and cooking delicious meals for family and friends. Sabelo grew up in Joweni location in Nqamakwe, a small town in the Eastern Cape near Queenstown. After his schooling there, he made his way to Cape Town in 1988. His mother was a strong influence, both in the village and in Sabelo’s life, encouraging him to follow a career. He initially chose teaching because he was able to get a bursary to study, but at college he fell in love with teaching. He qualified as a generalist primary school teacher in 1993 at the Cape Town College of Education. In 1999, Sabelo was selected to complete a primary school History project at the University of Cape Town, a joint project with Leeds University in the UK, which resulted in him attaining a professional Diploma that year. This reinforced his love for teaching History and English. Sabelo started his teaching career in 1992 at Mokone Primary School in Langa, and moved to Sophakama Primary School in 2000. After seven years, he was promoted to Principal there. Sabelo works hard at overcoming the school’s challenges and has embraced the Partners for Possibility Programme, which has meant positive changes at the school. Sabelo still enjoys teaching. Seeing his learners doing well and making an impact in the local community are what motivates him. In his spare time, he spends time with his wife and three sons, reads and watches interesting TV programmes. Bonke is one of four siblings and grew up in a small location called Scenery Park in East London. After attending school there, she moved to Cape Town to complete her tertiary education. She completed an Office Administration Diploma at West Coast College. In 2014, she started working at Sophakama Primary School while completing her internship, and then continued at the school as a volunteer, helping in reception, in the school choir and wherever needed. When the Year Beyond Programme began at the school this year in January 2016, Bonke took on her first employment role as IT Facilitator, managing the young volunteers and the computer lab. She enjoys being able to give back to her community in this position and would love to be a teacher. It makes her proud to be part of something that helps children achieve the basic skills of reading and counting. Watching children try their best to achieve these skills has motivated her to apply for Teaching and Human Resources Management degrees for next year. Bonke stays in Dunoon with her younger sister. She enjoys singing, reading magazines and going out with friends. She is also very involved with the youth at her church, is a Sunday School teacher and the Circuit Secretary for the Cape West Coast Wesley Guild, a church organisation that guides, inspires and develops young people in the Church and in the community. Our programmes attract a diverse group of volunteers from local communities ranging from Youth from Dunoon and other communities to older, retired people to moms with children. Volunteers are drawn to our programmes by the learners’ enthusiasm and willingness to learn. It’s heartwarming to arrive at the school and have the learners run up to you for hugs and high fives or ask to read a special story or play a favourite game. 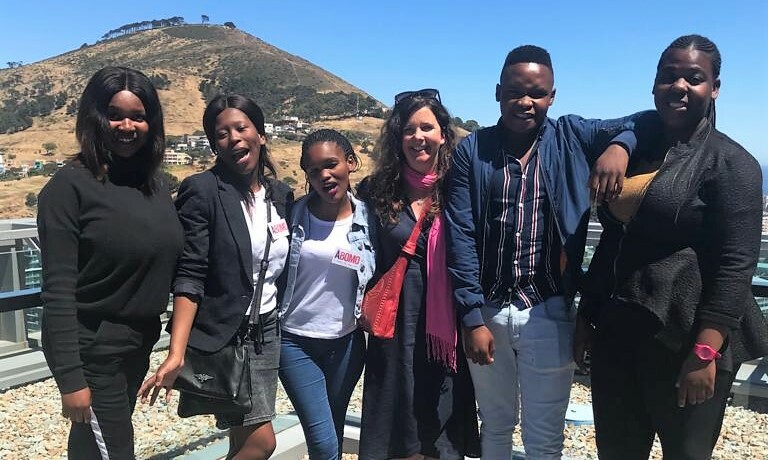 This volunteering experience has even inspired some of the English volunteers to learn basic isiXhosa to facilitate their sessions with the learners. We cannot over-emphasise the value we place on the time and effort offered by all our volunteers!